The Welsh players rectified the fortnight of 'hurt' that succeeded the Scotland game by beating Ireland 22-9 on Friday night. Interim head coach Rob Howley believes Wales produced the perfect response to recent criticism by beating Ireland 22-9 in the Six Nations on Friday. Howley has taken the brunt of the flak following back-to-back defeats against England and Scotland and raised some eyebrows by naming an unchanged side for the visit of Ireland. However, the players answered Howley's call for a reaction, with George North - one of the players who came in for particular scrutiny after the previous loss at Murrayfield - running in two tries in a thrilling Test match. Rob Howley "We are a very proud bunch. We were hurting and we deserved that this evening. 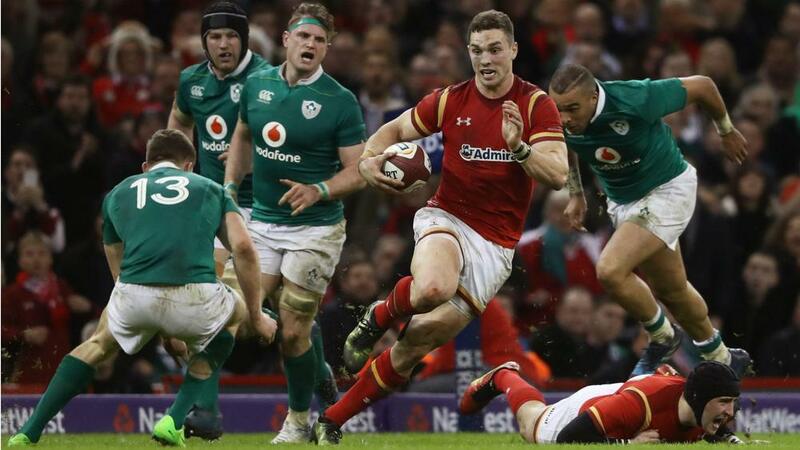 I'm delighted for the players"
"We knew there was going to be a reaction and against one of the best sides in world rugby you have to play like that, with and without the ball," Howley told BBC Sport. "There's been a lot of hurt in the camp over the last couple of weeks and I'm just delighted and very proud of the players. "They deserve that. They've taken a lot of stick - the coaches and players alike - and we beat a very good Irish side today, and I thought we beat them emphatically as well." Asked whether North needed his "kick up the backside", Howley added: "It's our Welsh culture! "I think when you praise them too much they sit back and become relaxed, but if you criticise them too much they might go into their shells. There's a fine balance. "We don't do it easy. We always do it the hard way in Wales. But they'll grow after today's performance. "They need to believe in themselves and we'll get better." Captain Alun Wyn Jones said his team had to put in a strong performance for the fans and themselves. "I think we owed it to the large proportion of Welsh people in this stadium, and secondly to ourselves," he commented. "We haven't done ourselves justice in the last two games and that was the priority today. I think we did that."